It’s a precarious time for synthpop bands. With the return of both Leftfield and The Chemical Brothers, not to mention the reappearance of The Prodigy, synthpop bands would do themselves a favour if they went back to basics their pop sensibility. This includes keeping their distance from what the top 40 pop sound has turned into, tracks tinged or dunked into r&b and soul. Glaswegians Prides have done this to some extent in their Island Records debut last month, ‘The Way Back Up’, but they couldn’t maintain the quality of their songs. 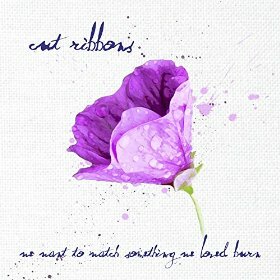 In contrast, the buoyancy of the songs on Cut Ribbons‘ debut album tell me they’ve got both the songwriting and performing chops, and I believe both will serve them well as they support this album and beyond. Frankly, I have no idea how you can listen to ‘We Want to Watch Something We Love Burn’ without smiling and wanting to wave your arms in the air. Outside Patterns on Thursday at the Great Escape this year was a rainy, dreary mess to open the festival. The kind of day where drinking seems to be the only decent option to spend the day. The Llanelli, West Wales band paid no mind to this, as their light touch with their songs brightened everyone’s spirits and closed out the Gorwelion / Horizons afternoon showcase on a high note. There’s something very special in the main singing duties shared between Lluan Bowen (keyboards) and founding member Aled Rees (guitar), whether they’re singing in sweet harmony or they’re taking turns on lead. Cut Ribbons songs can sound like the kind of music you’d expect soundtracking the latest Disney flick, except that you’re continually reminded by the nimble synth lines that this music can be enjoyed by adults too. Like the aforementioned debut from Prides, there’s been effort on here to include some slower numbers to break things up but comparatively, the Welsh band come through head and shoulders better on the ballads than their Glaswegian peers, showing believable sensitivity on the dreamy ‘Truth in Numbers’ and ‘I’m a Wretch’. But you’re not really here to listen to me waffle on about the ballads on a synthpop group’s debut LP, are you? Right, let’s get to it. With its booms of percussion and synth chords alongside the memorable guitar riffs, ‘Clouds’ mesmerised me live, with the chorus “Saw all the colours with you / kaleidoscopes with a view / caught everything that you threw / ‘cos that’s what lovers should do” chronicling the unbreakable bond of a strong relationship. Less about destruction than the end of an era, a synthpop ‘There Goes the Fear’ contending “we’ll sink like a stone, into the unknown”, the relentless title track is a cardiovascular workout. Similarly, album standout ‘Walking on Wires’ will keep your heart rate up, while lyrically being inspirational as two people go forward together in strength, just as Bowen and Rees’ voices join in beautiful harmony: “hold on tight this time / two lost souls defined / everything’s gonna be fine / everything’s gonna be fine”. Near the end of the tracklisting is ‘Bound in Love’, its ’80s pop heart on full display while the guitar and xylophone notes bounce and its connecting passages build anticipation to ride you out to the crest of the next wave. Less frenetic in structure and more anthemic is ‘White Horses’, which skirts that Disney / Olympics-ready line. Throughout the song, the band build a wall of sound with guitars, synths and drums that’s more reminiscent of what a psych band would do. But it works and works well in this context because they’ve arranged it smartly so that Bowen and Rees’ vocals sound sweet and are loud enough in the mix to hold their own against the instrumentation. And hurrah, I think Cut Ribbons are the only pop band whose album I’ve heard this year that didn’t end with a snoozefest. ‘Sink Ships’ concludes the album on another bright anthemic note, even if the song revisits the earlier theme of the unknown. Cut Ribbons are a young band, so anxiety is to be expected about the future. Though one wonders what they’re feeling so anxious about, putting together a winning album like this. ‘We Want to Watch Something We Love Burn’, Welsh band Cut Ribbons’ debut album, is out tomorrow, the 21st of August, on Kissability. To read my coverage of them performing at the Gorwelion / Horizons showcase Thursday at the Great Escape 2015, go here. To see them in action as well as see yours truly be interviewed about their performance, watch the video here on >the Gorwelion / Horizons page on the BBC Web site.